If you’ve been following Fighting for the Faith’s coverage of Steven Furtick’s Code Orange Revival, you’ll know that, thus far, the so-called ‘preaching’ has been an irredeemably dire exhibition of narcigetical scripture twisting. With just one exception: Matt Chandler bravely preached a decent sermon that actually pointed people away from themselves and towards Jesus Christ, the only One who shed His blood that people might be saved. The team decided to focus the rebroadcast on Jesus, so we reformatted the content a bit – We are trying to stay in the flow of what the Spirit is leading us to do. Steven Furtick was embarrassed by Matt Chandler’s implied criticism of his teaching. So we pulled reformatted Chandler’s sermon into non-existence, even though this meant that people wouldn’t hear about their fallen condition and be pointed towards Jesus – We are trying to stay in the flow of what a spirit is leading us to do. For more Code Orange coverage, see Apprising Ministries, Fighting for the Faith and Do Not Be Surprised. According to her Facebook page, Bendickson is Elevation’s ‘Outreach and Communications Director’. Hers is thus as official a statement as one could hope for. Now, it is possible that Schultz’ and Bendickson’s apparently contradictory explanations can be harmonized. 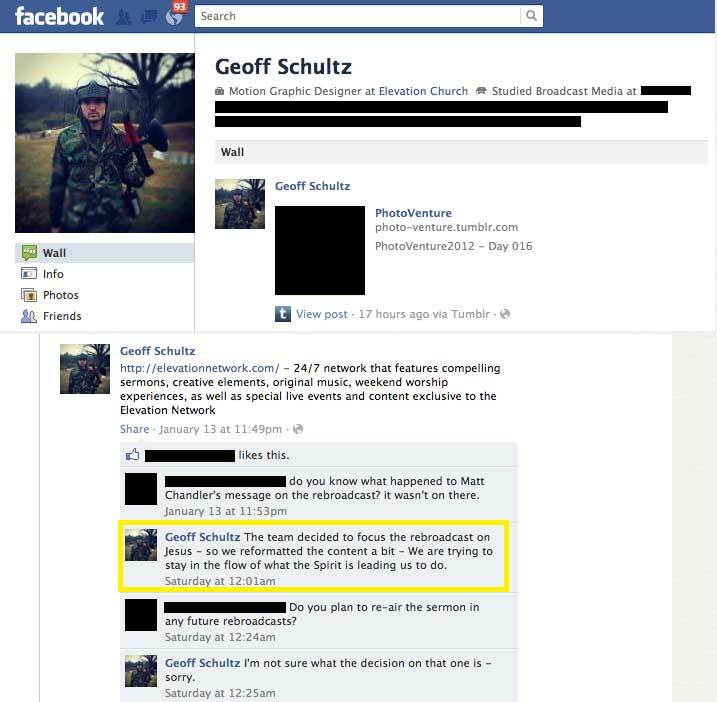 Or perhaps Schultz was simply mistaken in his original post, even though he seemed to have first-hand knowledge of events. One also wonders whether, if Chandler’s good sermon had led to a great many prayer requests, why Elevation wouldn’t want to rebroadcast it immediately, for the benefit of everyone watching. Or perhaps the prayer requests were not the result of the sermon that people had just heard? As it stands, Bendickson’s statement raises more questions than it answers. The greater story, though, will continue to be the overall content – Matt Chandler’s sermon excepted – of the teaching at the Code Orange Revival. How sad to reduce the word of God to nothing more than carnality and self gratification.May God open the minds of those that seek to dismantle the ‘true gospel’ of Jesus Christ.Having seen the Matt Chandler’s sermon before it was erased from the public ,I was cheering him on for being so……biblical! Agreed, Daniel, thank you for the comment. I thought Chandler was very measured in what he said. If offence was taken, it must surely have been at the content of his message, not in its manner of delivery. Yet, no true pastor ought to be offended by a message that points out that the Bible isn’t about us, but Jesus, and that we are all sinful creatures in need of Him as our Saviour. Well, When I heard the message, I was shocked, I thought to my self, Matt, he pulled a Jesus. In which he went into lets, say, the pharisees temple and basically gave them salt in their sugar sermon, but with Love and truth as Jesus did in the temples, and even then they wanted to stone Jesus. We get a lot of criticism from Christians, Go figure. As I watched the youtube version, then went to watch it from a different web broswer, it was removed that fast… Good thing I downloaded it. Truth hurts, which is why people do not want it. We NEED a Saviour, Jeremiah 10 says the heart is deceitful above all things, who can know it? Pretty simple to understand. Furtick got angry at Matt Chandler for calling him out for all the focus on Elevation / Furtick himself and not Christ. Furtick pulled the broadcast and only relented to repost it after the backlash from the web. Interesting to note that the Elevation staff cut out the parts of Matt’s sermon that called Furtick out. Do you have a link to the edited version of Chandler’s sermon? You sound like a religious pharisee. You think you are God’s police man to give citations to people who you think are not doing a good job. Why don’t you build a church, lead thousands to Christ, and see how much resistance you get from the enemy for doing things for Jesus. It’s sad to see that the resistance is from the church. Quit dividing the body of Christ and focus on what you plan to do for the Lord. God is great and we need to stay focused on that. Chris, you are welcome to state contrary views here, but I refer you to points 3, 4 & 5 of this site’s comment policy. Secondly, may I commend to you this excellent article? May our great God and Saviour in His mercy grant you His wisdom, peace and grace. I have been watching code orange and I have not once gotten the impression that it was all about Ps. furtick or the church. Every thing I have heard has told people to look to Jesus. I have heard Jesus being lifted up without reservation or shame. I also heard Matt Chandler’s sermon; he had some good points, but overall his view of God being all about himself is in error. This revival has challenged me to dive deeper into the things of God and compel people to come to Christ. If you view looking to criticize, you are going to find something to criticize. The greatest critics of the people of God is the church of God. Donna, you may have watched more of the evening services than I have; I’ve listened to most of the past five nights though. While some people might be critiquing how things seem to focus on Elevation Church or others involved in the meetings, I assure you that isn’t my issue. My concern in what I’ve heard is the way that Jesus is spoken of in the meetings. With the exception of Chandler’s message (and from what my wife says, some of Pastor Furtick’s statements during the praise singing last night), there hasn’t been much raising up of the Gospel, by which I’d mean Christ’s perfect life fulfilling the law and atoning death paying sin’s penalty, which we all owe as sinners, and how we can be forgiven of all sin and seen as having Christ’s righteousness through repentance and faith. Instead, the emphasis in the messages I’ve heard has been on what each believer should be doing, or must do, or has the power of choosing to do. Even trying to use the best construction, nearly everything I’ve heard has been law, presented as something achievable for the believer if we try hard enough. Simply put, that’s not Scriptural; we can’t meet God’s standard of perfection no matter how hard we try. What’s been missing from too much of what I’ve heard is the pointing of people to the cross, to resting in the work that Jesus did, not what we do. That’s not just a message for the “unchurched” or the unbelieving; it is the only message that can keep hope and life in the believer and free him to actually go out and do the things that have been so much the focus of the conference. Frankly, Chandler’s message included a similar (though far more courageous *and* lovingly framed) rebuke, and Furtick et al haven’t seemed to take it well. Based on some of your comments, I’m guessing you and I differ theologically, Donna, so we are going to critique some things differently. Regardless, I would encourage you to keep the cross first and foremost in how you think about what you’ve been hearing at the conference. It is our only hope of salvation, and our only means of sanctification, and if we lose sight of that, we will get swept into the fatigue of moralism and pietism. Worse, we might teach others that those things *are* Christianity, practically omitting the gospel; would anything be more tragic? Haters gonna hate…… Maybe God works in different ways through different people to reach different lost souls. Nothing I have ever watched from pastor furtick has made me question his desire for people to give their lives over to the Lord…. The savior….. The cross. Maybe instead of bashing him online we should be asking God what way he wants us to be used by Him to reach lost souls. We probably “differ theologically” also. Just be careful about critiquing something that God is blessing and possibly called someone to do. Just a word of encouragement! And really, no one is pointing to the cross perfectly…. Are you? No, I’m not pointing people to the cross perfectly; that’s why I desperately need to be reminded daily of the cross myself, and why I see that message as so critical for every person (believer or no) to hear constantly! Your caution is reasonable; we should be careful that our critiques are in line with what God wants. How do we know that? By comparing it to His Word. That’s discernment, and per Acts 17:11 (a positive example) and 2 Jn 7-11 (a negative example), it’s something God commends. I know the pettiness of my heart, and I fight to keep that from affecting any comments I make regarding Elevation Church. I’m sure I do not completely succeed, and again, that knowledge drives me to the blessed cross. Will God use this event to bring some to salvation? I know the Gospel has been preached, so I pray so. Also, it seems to me that since this whole thing with Pastor Chandler came up, there has been more of an explicit presentation of the Gospel; I cannot say whether the two things are related, but I rejoice any time repentance and faith in Christ is proclaimed. I don’t discount the Law; it is a gift, because it tells us what God expects, and drives us to the cross with the stark knowledge that we cannot ever meet His demands. Again, the Gospel isn’t just about salvation; it is the only thing that frees believers to do the things God calls us to do, because we can act secure in the knowledge that Christ’s blood covers even our imperfect obedience! Emotional appeal or exhortation to do better are no substitute, and the law of love is no gospel. One thing is certain here. Elevation Church is doing some awesome things for the kingdom and in the community of Charlotte. But hearing stories from people who used to be employed at Elevation and work for Furtick himself, its sounds like there are also a lot of weird things that go on behind the scenes that just bring in a lot of questions. This Matt Chandler thing is just an example of how everything there is so carefully messaged and marketed in just the way the leadership needs it to be. Time will tell whether this is a movement of God or a movement of man. Only God can judge motives. Elevation seems like they are on track to achieve their goals of becoming large like the new Inspiration network or TD Jakes type church. No matter what God will use it for His glory either in success or failure. Respectfully, it actually isn’t. Partnering with heretics isn’t something God will be behind. The very “weird things” and “marketing” you speak of already indicates to us it’s of man. The Biblical critiques we’re doing shows us it’s not of God. “Only God can judge motives.” None of us have judged motives. Here, we agree. The problem is, it purports to be an evangelical Christian church; not interfaith inspirational or Word Faith as his the heretical T.D. Jakes. Even if it were, that’s not what Daniel and others are critiquing. It is DISGUSTING to read these derogatory, cruel, manipulative, evil comments most of you have written on here. I have BEEN to EVERY NIGHT of the Revival & you all are completely wrong on so many levels. Who are you to pick apart Pastor Steven, who happens to be one of the most humble people I know, for doing something bold to win hearts for Christ?! He NEVER glorifies himself or Elevation and is ALWAYS focusing entirely on Jesus. He gets uncomfortable when people clap for him, let alone if someone were to put any focus on him or Elevation. He is an incredible man of God and I commend him for remaining true to what God has called him to do despite all of the people out there like you who think you know what you’re talking about.You all should be ashamed of yourselves, Do you think God will reward you for criticizing one of the few genuine Christ-following men out there? Don’t think so. Shame on you. I can’t speak for anyone else, Kristina, but if you’re referring to anything I wrote, I’m sorry you’ve misread me so completely. I’m sure you disagree with my point, but I’ve been as careful as I could *not* to ascribe motives to Pastor Furtick or the other speakers, to accuse them of any personal failings, or even to speak about them as individuals. The message they publicly proclaimed was my only focus; based on Acts 17:11 and Phil 1:18, I believe it’s Scriptural to evaluate a message completely apart from the motives of the messenger. It is your right to see that as “derogatory, cruel, manipulative, [and] evil,” but that wasn’t my intent. I’ll leave it to other readers to make their own judgements. Who are you to attack these men here, who are some of the most humble people I know? It is surprising to see people show up here and sling insults and judge people for judging, while not actually engaging the issue from a Scriptural standpoint. I have been telling my husband (Jason here) that I have been shocked to see Furtick attempting to preach the gospel in between sesssions. But he can’t seem to see how he is taking away with his right hand what he gives with his left, when he partners with heretics preaching ‘the victorious life’ or straight up Pelagian heresy. Jakes himself doesn’t believe in the Trinity, and as such is a heretic outside the Christian faith. Next thing we know Thomas Monson will be on that stage. After all, his organization does a lot of charitable good works too. And they aren’t nearly as silly and ostentatious in their worship experiences. We’re merely doing what Jesus wants us to do cf. Acts 17:11. And with all due respect, what Pastor Steven are you talking about. The one at Elevation gives every appearance of the opposite of what you’ve stated. “He gets uncomfortable when people clap for him, let alone if someone were to put any focus on him or Elevation.” That’s what I heard him say but as I watch the de-vival he injects himself into virtually every segment of it. “He is an incredible man of God…” No, he isn’t. I don’t know his eternal status; but I do know this, he has been in violation of God’s Word just in this de-vival alone. He’s turned his pulpit over to a pastrix, promoted Word Faith heresy and the modalist heretic T.D. Jakes. No “great man of God” would ever do that. Please be careful not to get caught up in what is beginning to head into cult-like status. I attend Elevation Church regularly. I was personally in the ministry with my husband, a Pastor, for 35 years. This church is a blessing to me. Pastor Steven Furtick preaches Jesus alone as the only way to Heaven every week. The Lord has blessed the young man beyond measure. I read into your criticisms the typical human response to jealousy. The Father is blessing him and his work in a different way than He is using you and you are sulking. I raised 3 children and know this response. Grow up! Be grateful for your own place in the ministry and rejoice in all those who are being touched by this Godly young man. Then attend this church just once and see for yourself what the Lord is doing. I have seen many criticisms over my years in ministry. These are always said to be based on “concern for the message” but are really based upon insecurity and jealousy. Remember what Paul said? Regardless of whether you like the style, Jesus is being lifted up! Praise God! I’m interested — what do you think the author is jealous of? Susan, I can’t speak for anyone else, and you are free to doubt me, but I’m quite certain any critiques I’ve made aren’t rooted in jealousy or sulking over God blessing Steven Furtick’s ministry in a different or greater way than my own. For one thing, I’ve never been in any sort of full-time ministry, and I’m very sure that isn’t what God has gifted or called me to be doing now. For another, I think Scripture is quite clear that what God desires is faithfulness to His call, not numerical growth. If He chooses to expand one church which preaches the Gospel faithfully, it is to His glory. If He chooses to have keep another such church small (or even constrict it), that also is to His glory. It’s sadly ironic that you and others would accuse me of having bad motives when I’ve gone out of my way to avoid doing the same regarding Pastor Furtick et al in this thread. Please realize that you make my case by alluding to Phil 1:15-18. Paul isn’t speaking about style at all in that passage; he’s speaking to the motives of the ones preaching Christ. Note the fundamental assumption here: that Christ is being preached (and according to Gal 1:8-9, that means they are preaching the true Gospel)! Once more, we return to need for discernment and evaluating what is being taught, so that we can know that it’s in line with the Scriptures. Once that has been determined, we can echo Paul: “The important thing is that in every way, whether from false motives or true, Christ is preached.” But *only* once that has been determined. Pastor Furtick’s personal qualities, while they are important regarding his biblical qualifications as a minister, have no direct bearing on the Scriptural fidelity of his public messages. Elevation’s membership numbers and humanitarian work, though significant, do not prove God’s blessing is on the church or validate that the Gospel is being preached and the body edified. The only thing that can show Furtick’s teachings are Scriptural is careful comparison of them to Scripture; that is my only concern, so that was the content of my comments. Heres an idea if y’all spent as much time focusing on your own church as you do ours you may get to experience the glory of God like we have got to experience at Elevation. So keep making up stories because if people aren’t talking about you then you clearly aren’t doing something right. I sure wish someone could come up with some video of Furtick’s demeanor during Chandler’s sermon. I noticed tonight (the last night) Furtick making more incorrect allegorical application of SCripture, using David and Goliath again. Very typical. But oddly enough, when these MEGAchurch pastors with all the money allegorize they see themselves as the diminutive David with only a slingshot and a couple stones, standing up against the giant, well armored… blogger who is blogging from his mom’s basement in his pajamas. Now, which one of those two would better fit the ‘nobody’ that David was at the time, and which one better fits the profile of the giant, well-armored Goliath? I submit it’s the handful of bloggers armed with their computer and no money, doing this in their spare time, vs the guy who is raking in bucks from people, has a professional media team, and a multimillion dollar facility. The real work of the church is done in every day lives, without fanfare. That is why people like Furtick and the “haters” that showed up here today think it’s not being done: Because the real church actually tries to live out Matthew 6:1-4. Yes – it’s all rather ironic, and very sad. The fruit of the Noble–Furtick movement is becoming very plain. Anyway, good points, Paula, as always – thank you for all your comments here. My wife and I have had the honor of serving in Elevation Church for over four years. I’ve been a Christian for 44 years and a full-time Christian servant for 40 of those years. I have been a pastor, Christian school administrator, coach and teacher. I say this not to boast, but to simply point out that I have followed my Lord for many years and have had the privilege to sit under some of the greatest men of God of the past 50 years. In many ways, Elevation Church is radical, but the love for Christ and the desire to win the souls of mankind and honor and glorify God is evident throughout that ministry. There are no perfect ministries because there are no perfect Christians. It has always amazed me that some Christians spend more time trying to point out the errors of other sincere Christians than winning the lost to Christ. Why not focus on going about turning the lost to Christ and building them in the faith and let God judge other ministries. It’s oh so interesting that every one in defense of Elevation has responded in a negative, attacking “haters gonna hate” tone. Not backed with scripture or even intelligent rebuttle. Judging a tree by his fruit clearly shows some animocity. This is not the gospel I know. I would love for an “Elevator” to show itself with some scriptural “defense”. There is NOTHING wrong with Christian’s challenging each other and calling each other out in false doctrine. But the “you’re just jealous. shut your mouth. go * yourself. if you paid half as much attention to your church… blah blah blah” doesn’t help Elevation’s case. In fact it makes you look worse. And a big AMEN for that distinction vs.distortion Sara. Q:To the “Elevators” Should not the approach and tone between brothers and sisters in Christ be one of rebuke and correction ‘out of love’ for one another? Q: Are you responding using the Scriptures (not one’s feelings) as your guide while correcting those of us that may be in error? I for one am not above being corrected.Defending biblical doctrine and truth comes at a price.Who among us is willing to pay? Mere words of pettiness,hostility and angry tones without any biblical texts to reference,sounds more akin to hurt feelings and bruised egos. Q:To the “Elevators” (In all seriousness),if those in opposition are incorrect, where then is the lack of concern for our apparent blindness?As has been stated by a few in this blog,if the Holy Scriptures do in fact and in context say otherwise,please make our being deceived plain to us.Are not we as followers of Christ commanded by our Lord and Savior to do just that? Not out of vengeance bur rather out of love for God and your fellow man and their eternal destinations on the other side of this life! I think the problem with all of us Elevators is that we sense a ‘holier than thou’ attitude from the blogger. Have any of you been to Elevation or experienced the Worship Service? I am not a kid. I am 57 years old. I accepted the Lord as my Savior when I was 4 years old. I married a Pastor after going to Bible College and served as a Pastor’s wife for 35 years. I am from a very conservative Biblically based denomination. I love this church, the Pastor and the teachings. It is so Biblical and Christ honoring. This is my experience. To read such negativity is disturbing, because I see nothing in anything you say happening at this church. Jesus is lifted up as God and as the Savior of the world, if we accept Him. We hear this each and every week. There is the honest truth. I’d love for you to experience in person just one service. Susan, your honest frustration comes through, and truly, I empathize: you read critiques and they don’t line up with what you’re seeing at Elevation, and you can’t seem to find a way to get the critics to understand that. It’s exasperating. Please understand that sword cuts both ways. What I’ve tried to write has been about particular messages and trends within messages, comparing them to Scripture. I’m not trying to take away Elevation’s candlestick! Yet the responses I’ve gotten have almost universally not addressed the substance of my arguments, but instead have called me names or dismissed what I’ve written by attributing juvenile motives to me or otherwise mischaracterizing my person. My frustration is not that you don’t agree with me, but that I don’t think you’ve understood my point before rejecting it. Because if you did, you wouldn’t claim that experiencing a worship service would clear away my objections. Honestly, I don’t expect to convince you or anyone else that I’m right; at best, I hope to remind people of the biblical call to compare what we are being taught to Scripture, and to hold ourselves and our teachers accountable to it. If believers do that, then I know the church will be strengthened and the Body will grow in maturity even if I personally disagree with some of their conclusions or doctrines. I really love your blog and I love that you can see the heart of Christ in your replies to people. I pray that people’s eyes will be opened to what God wants them to see. The main issue is that are people truly learning about Christ, are they growing in The knowledge of The Lord and all by the leading of The Holy Spirit? I’m still a baby christian and I remember yearning to learn more about Christ but hearing so much about what I could GET from God. We are in the last days, people need to realize NOW is the time to truly be sure if you are a child of God, if you are going to a church where you are receiving the TRUE word of God and not watered down gospel because we are living in the times where false teachers and preachers are rampant. I’ve noticed that people seem to exalt HUMAN preachers over God. They gravitate to a preacher because THEY like how the person preaches or their enthusiasm or personality…it’s not just about Furtick, it’s about people letting their guards down and not using the wisdom of The Holy Spirit to guide them to TRUTH as He was promised to do. It’s all about The Lord, we all need to humble ourselves before Him instead of trying to defend any human being. .
Debbie, thank you for visiting and for the encouragement. You make a number of excellent points. @betterthansacrifice Be encouraged! Keep on rightly dividing Gods word in truth and in love! Be the salt with all its savory usefulness. I attended Elevation for 2 years and recently my family has made a move away. Yes Pastor Furtick is a gifted speaker, and does preach the word of God, but in all honesty. Elevation has gotten too big for its britches, They constantly talk about how they are doing so many great things in Charlotte…..Every service starts with a video showing how “your chuch is changing the world” Well folks, its not “your” church, its Jesus church, and elevation your not doing great things in Charlotte, God is….in fact if Elevation ceased to exist tomorrow God would accomplish everything he wanted accomplished in Charlotte without you. The problem is Pastor Furtick continues to work up the crowd emotionally boosting their and his egos that this church is the end all be all of all churches. Why does a Pastor need 5 bodyguards to walk him everywhere he goes, Why does he need a driver…..why does the greeters once he enters the auditorium close the doors and let no one else in? This is a man who thinks he is a rock star…. People come sunday, they crowd the lobby, they thow opne the doors and herd you in like cattle, telling you where you can and cant sit….then when its over they herd you out just as fast because the next line of cattle are waiting in a line that wraps around the building……between services Furtick is swept away by his entourage to safe room..Everything there exists for putting on a good show on Sunday….there is no personal feel to the church….I was out of work for 4 months over the summer, I called the church office and emailed multiple times asking for prayer and never heard from them once. Why because all they care about is putting on a great show on Sunday!……People from other churches in the area stepped up and prayed for us and made sure my wife and kids had things we needed. We visited a church in Charlotte last week and at the end of the service we were not herded out, in fact you could go to the altar and pray, and if you wanted the Pastor was there to pray with you….no entorauge, no armed guards, just a humble man of God tending to his congregation. Wake up Eleavators…..Matt CHandler was right and it got me out of Elevation. God is for God, God is not For pastor steven and elevation. Thank you for the first-hand experience, Walt – I really appreciate your having taken the time to share that. What you describe is overwhelmingly sad. I pray that you’ll settle in a good, caring church where you’ll be fed with the Word rightly divided every week. Praise God for faithful pastors, and for those who rallied round and supported you and your family in your time of need. The good thing is that as a result of this…Matt’s sermon has got more exposure than it could have gotten with just a re-broadcast.